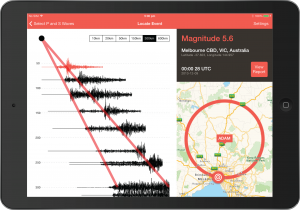 Launching at AGU in 2013, our first iPad app, Quick Quake, brought a way of visualising earthquake locations that nobody had ever seen before. It is an excellent tool for educators, and it is the perfect tool for duty seismologists that need to quickly check the automatic event notifications sent from eqServer. The process of locating earthquakes has never been easier – simply pick one of the stations that recorded the earthquake, mark a P wave arrival and S wave arrival, then move the earthquake around this station until all of the other station waveforms line up. The whole process takes less than a minute, and gives you the confidence to proceed with emergency management tasks rather than wasting time analysing data from scratch. Quick Quake is available free in the iPad App Store, and includes real earthquake demo data so that you can go through the process of locating an event, even if you don’t have eqServer yet. A brief YouTube video of the app in action is below.